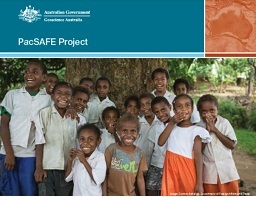 The PacSAFE project is a response to demand from Pacific Island Countries for tools to better understand disaster impacts. The project will engage with representatives from national disaster management offices and related agencies who are involved in planning, preparing and responding to natural disasters. Geoscience Australia, as Australia’s technical implementing partner, will continue development of the functionality of the PacSAFE software tool. PacSAFE is a desktop tool based on QGIS and InaSAFE, designed and developed for non‑GIS users.